We measured a selection of these jackets and also tried them on our Fit Check mannequins Huey and Dewey to see how they fit. Normally we’d put Huey in a Medium/42 US (52 Euro) and Dewey in a XL/46 US (56 Euro) but this model runs smaller than most Euro sized jackets. In our photo gallery, Huey is wearing a Euro 54 and Dewey is in a 58 which both look great. This product is sold in European sizes. Generally speaking, the US chest size in inches is equivalent to roughly 10 points less than the European jacket size. Example: a 56 Euro jacket is similar to a size 46/XL men’s US size. But since this jacket style runs a bit more snugly, we recommend buying one size larger, add about 12 points to your US chest size to get the right Euro size. I’d suggest you measure yourself with a tape and get your chest size and belly size, then use the size chart to pick the smallest size jacket that will be big enough for both your chest and belly using the chart below. Approximate US alpha sizes are also listed in the chart so you can check if the jacket size you choose is the same alpha size as you normally wear in men’s clothing. I’d call the overall cut of this jacket “sport casual”. It is meant to fit snug, but it doesn’t taper nearly as much as sport/race jackets. The difference between the max chest and max belly is about 2” or less. With sport/race jackets the “drop” from chest to waist will be more like 4” to 8” depending on the model. The overall fit if this style is much more forgiving and will fit a wider range of body types. Sizing tips for upgrading armor: If you plan to add a back protector add 1” to your measured chest/belly size before using the size chart. The Dainese Freccia 72 jacket is another style in their limited edition Settantadue collection of jackets. Settantadue means “seventy-two” and Freccia means “arrow”. This jacket style is offered in either a solid leather or perforated leather version. Both versions are a classic Cafe style. The Freccia 72 comes with Dainese Pro-Armor in the shoulders and elbows and a compartment for a back pad which is optional. The Freccia 72 is another style in the closeout group we obtained recently which includes several styles from Dainese in the classic Cafe style. This jacket adds a bit of Dainese style with the arrow graphic in back and the double stripes on the sleeve… horizontal strips on the left sleeve and vertical stripes down the right sleeve… another classic Dainese style. The Freccia shares the same fit, protection features and leather specs as the more plainly styled Nera 72 style which we are also offering on closeout, so many of the comments you see on this product page are shared with the Nera solid and perf styles. The stripes on the blue and red solid color jackets are contrasting white, while the all black jackets have stripes in black suede leather. The leather used in all the choices of the Freccia 72 offers a classic shiny finish. The solid jacket feels a bit thicker than the perf model, but both are motorcycle weight leather. Even though the styling might pass for a fashion jacket, these are heavy duty leather jackets… not just a pretty face! Both the solid and perf jackets might measure out with the same thickness of leather and perhaps the perf version feels a bit lighter just due to the perforations. Anyway, both are built to be protective, but also very stylish. Take a look at the close-up photos of each jacket style to get a good idea of the look and feel. The perforated leather version is sold on this product page and you can take the link below to view the solid leather version sold in three colors. Both versions offer the same fit. 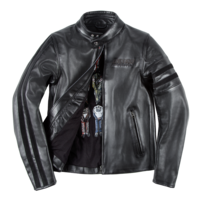 Of course, the solid leather jacket will work best for those riding in a cooler temp range where the perforated version is better for warmer weather use. One thing I really like about the perforated jacket is how the micro-perforations cover nearly the entire jacket except for the leather right near the seams. It’s a sharp look, but also adds to the jacket’s sturdiness. Where the jacket is stitched together is solid leather which is stronger than the perforated leather. That treatment is even done around the pockets, stripes and main zipper too. I really don’t know how they do this, but I’m impressed. The overall styling really reminds me of classic Cafe styles by Vanson or Schott but with the classic added stripes on the sleeves and the arrow design on the back which are both 70s ear designs from Dainese. The style really works with any style of riding really, but I think it would look extra sharp with retro style street bikes like Triumph. The looks are classic but this jacket has modern protection features that are very recent introductions by Dainese. The armor included for the shoulders and elbows is their new Pro-Armor type which is the honeycomb molded rubber you see from many premium brands. It is highly rated and is also soft and lighter than armor made of solid compounds. The back protector I’d recommend for this jacket is the Pro-Armor G back protector. Take the link below to order. It is a similar honeycomb design and will work great in a style like this. Dainese says: A freccia is an arrow. A symbol of speed and direction. Freccia72 brings you the three distinctive symbols that our legendary racers made famous – Dainese’s twin horizontal bands, vertical stripes down the sleeves and arrow stripes on the back. For a jacket that takes Dainese history and brings it into the present. With integrated removable Pro-Armor protection, superior quality cowhide, and a superb fit, Freccia72 is also the perfect traveling companion. Roll on the future.